Foreman’s General Store is proud to introduce the latest flavors, which can be found in store today. 1. SPG All purpose: SPG BBQ Rub is an All-Purpose Seasoning blend of salt, pepper and garlic. This mixture uses salt, pepper and garlic plus a few, small extras that send the taste of this seasoning over the top. This BBQ Rub is excellent on beef, pork, chicken, lamb and fish. All-Natural, NO MSG and naturally gluten free for you to enjoy and share with the whole family. 2. Texas Pecan: This is an all-purpose BBQ rub, it is super sweet and slightly spicy with a hint of Texas Pecan. It has a great aroma and tastes even better! This seasoning uses pecan smoke and oil which is perfect for grilling and BBQ cooking. Best used on pork and chicken. 3. 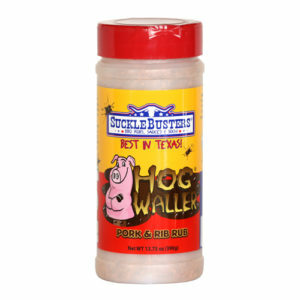 Hog Waller BBQ Pork and Rib Rub: Hog Waller has is super sweet with a slight kick of heat from chipotle and cayenne peppers. 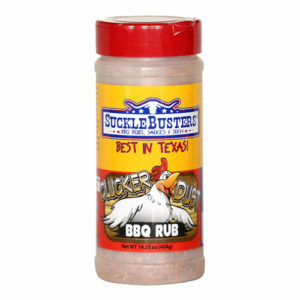 This is Suckle Busters #1 selling BBQ Rub. It contains three types of sugars and has a somewhat smoky flavor from the chipotle powder. 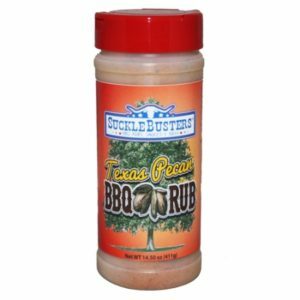 The rubs work well for Competition BBQ cooks, where it is generally used on Ribs and also works well for back yard BBQ. Many customers use it on grilled/smoked chicken. 4. 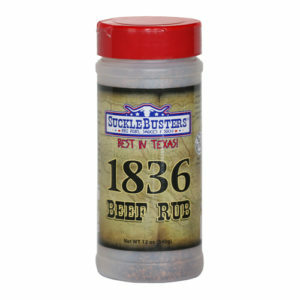 1836 beef rub: This BBQ Rub is loaded with traditional flavors used on beef. It is a salt, pepper and garlic blend with loads of half and quarter-cracked black pepper. Texas is known for it’s beef BBQ and this is a very traditional flavored BBQ Rub. It is perfect for brisket and steak but compliments any type of BBQ meat well. If you are looking for a prime rib seasoning – this is it! 5. Clucker Dust BBQ Rub: This rub is made for grilling chicken. It was selected by our customers as their favorite BBQ seasoning for chicken. The rub has a medium kick of heat provided by the chipotle peppers. The peppers also lend a nice smoky flavor and aroma. It is sweet and medium spicy. Although it is made for chicken, the flavor profile lends itself to any type of BBQ meat. This entry was posted on Thursday, April 4th, 2019 at 2:24 pm	and is filed under News & Updates. You can follow any responses to this entry through the RSS 2.0 feed. Both comments and pings are currently closed.